Whither the U.S.: Nuclear War Or New Silk Road? Dennis Speed: In June 1996, our keynote speaker appeared in Beijing at a conference which discussed the concept of the New Silk Road. She, and her husband Lyndon LaRouche, had designed—a bit earlier than that conference, starting in 1989—a concept of development and peace that would unify East and West. It had other names earlier—the European Triangle was one such name, and then later it was extended to Asia as the Eurasian Land-Bridge. A fight to make that concept real was begun at that time. During the period between June 1996 and January/February 1997, she was given the name the “Silk Road Lady.” At the end of 2014, a new report and a new evaluation was supplied by the Schiller Institute and published by Executive Intelligence Review; it was called “The New Silk Road Becomes the World Land-Bridge.” In this time of great turmoil, the capacity to concentrate and to focus on what the true goals of mankind and mankind’s future are, is of utmost importance. It is specifically important for Americans to hear that perspective from the eyes of people who consider themselves to be Americans in character and in principle. 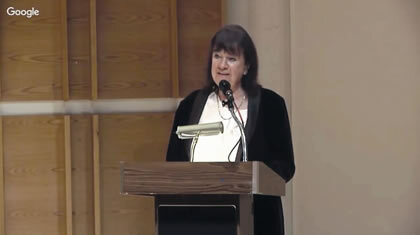 That’s the way that the Schiller Institute, from the time of its inception, has thought; it has always been from that time until now my great honor to introduce on whatever occasion it requires, the founder and leader of the Schiller Institute, Helga Zepp-LaRouche. Helga Zepp-LaRouche: Dear friends of the Schiller Institute, when we designed the title of this conference—and I hope I am not mistaken, because you gave a different name—I had the title of “Whither the United States? Nuclear War or New Silk Road?” We did not have exactly an inkling at that time that the seed of both options would be condensed in the two-day summit between President Trump and President Xi Jinping in Florida just a little while ago. But the first day of this summit was very positive. It was reported that the chemistry between the two Presidents was very good; President Trump called it an outstanding relationship and “lots of possibilities to get rid of potentially bad problems,” hoping that they will go away. President Xi Jinping, for his part, said that he received a very warm reception; that they had an in-depth communication, and he stressed the unique importance of the U.S.-Sino relationship. And, which is very important, he offered to the United States to join the Belt and Road Initiative, the New Silk Road. As many of you may know, I had called earlier that we must have a nationwide mobilization in the entire United States, that the United States must join in this fantastic new project. Obviously, what happened is not yet totally clear. Trump did not say anything explicitly; he didn’t take up the offer. But if he does, and I said this a little while ago—people were actually quite shocked to hear me say that, and I still say that despite what happened in the recent days: If he [President Xi] can convince President Trump to take up the offer to join with China and the other nations in the New Silk Road, he can become one of the greatest Presidents in the history of the United States. In light of what happened with the air strikes against Syria, many people may wonder why I’m still saying this, but I’m absolutely convinced of it. Because if we can get the United States to join and cooperate—and later I will elaborate what that will mean—it would mean to overcome geopolitics, which has been the source of two world wars in the past century. The United States would join what President Xi Jinping all the time calls a community for the shared future of mankind, and it would indeed begin a new era of mankind and eliminate the danger of nuclear war. The first day went very positively, but then during the night to Friday, the United States launched the military strike into Syria under the pretext that the Syrian government had allegedly used chemical weapons in the province of Idlib, which caused the deaths of civilians, babies. But no proof was presented. It was immediately contradicted by many ex-intelligence experts, saying this was a typical false-flag operation. Fortunately, President Xi Jinping maintained his countenance; he did not leave. They stayed for the second day and concluded agreements to have a new Cabinet-level framework for negotiations and continue a dialogue on four pillars: First, a diplomatic and security dialogue; then, a comprehensive economic dialogue; a law-enforcement and cyber-security dialogue; and a dialogue concerning social and cultural issues. Now this was obviously not our demand, but it opens the door. As we have seen in recent phone calls between the two Presidents, especially as a consequence of these strikes against Syria, the North Korean crisis is flaring up in a very dangerous way. At least the two Presidents got on the phone, and at times like this, this is extremely important. What happened is a de facto coup d’état inside the United States, which has two elements. 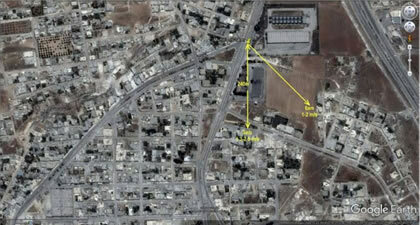 One is the false-flag operation in Syria, combined with what one could call a palace coup inside the administration. This coup—and I will elaborate on that also—is a British intelligence operation; and it must be recognized as such in order to liberate President Trump from this great danger. If you look at the chronology of what happened, March 30, both Secretary of State [Rex] Tillerson and UN Ambassador Nikki Haley said very clearly that it is no longer an option of the United States to oust President Assad, our priority is to fight terrorism and ISIS. One day later, the American Secretary of Defense [James] Mattis was in London and gave a press conference with the British Defence Minister, Michael Fallon, where he praised the British global role worldwide and threatened Russia, saying they are responsible for manipulations of the elections in the United States and Europe. On the same day, British Foreign Minister Boris Johnson, who already in December had called for a joint U.S. military attack on Syria, had to admit that the U.K. investigation about Russian interference in the U.S. election had produced no result. Then on April 4, there were the first reports about the bombing attacks on Idlib province with chemical weapons. The next morning, President Trump received his daily intelligence brief, and this brief said it was an attack with chemical weapons by the Syrian government. And as evidence, they showed photographs and videos of people dying, apparently from chemical poisoning. The source of this was an organization called the White Helmets. The following two days, there were National Security Council meetings in Washington, and on the same day, the House Intelligence Committee chair, Representative [Devin] Nunes [R-CA], recused himself from the investigation into the two narratives: one narrative being that Russia had helped Trump to become President; the other narrative being that the Deep State in the United States has been leaking classified information about Americans being spied on. These two narratives are in a showdown, and Nunes was on the right track, because he had received in meetings in the Old Executive Building, proof that there was such cooperation with British intelligence on this matter. So, he was accused by Citizens for Responsibility and Ethics in Washington, MoveOn.org Civic Action, and other groups, in a complaint to the House Office of Congressional Ethics, that he had not briefed [House Intelligence Committee ranking member] Adam Schiff [D-CA] first, but the President. In any case, he thought he had to recuse himself. It turns out that this Committee for Responsibility and Ethics in Washington is financed entirely by the British; George Soros, among others. Then the next day, on April 5, [White House Chief Strategist Steve] Bannon, the campaign advisor of Trump, was removed from the National Security Council. It is generally known that he opposed the attack against Syria. On April 6, in the middle of the summit with President Xi, when the decision was taken to attack the Syrian airbase with 60 Tomahawk missiles, Michael Fallon, the British Defence Minister, bragged that he was in constant communication with the United States on all levels—before the strike, after the strike—discussing the options. So, this immediately brought the world to the verge of a serious showdown with Russia. Many security experts, including Scott Ritter, who is a senior chemical weapons inspector who had numerous times in the past denounced the White Helmets, pointing out that the White Helmets were associated with al-Qaeda, refuted this immediately. Direction of lethal plume on April 4, 2017 between 3 and 6 a.m., assuming the munition crater identified by the White House is actually the sarin dispersal site. This organization, the White Helmets, was founded by a retired British military officer, James Le Mesurier; it receives $30 million from the British Defence Ministry, but also from the U.S. State Department. They have quite a portfolio of $100 million, and they have been seen in videos assisting al-Qaeda in the execution of Syrian soldiers. The idea that this evidence, that it was the Syrian government who did that, was refuted two days ago by a very prominent nuclear weapons expert, MIT Professor Ted Postol, who was the single person who, in 2013, proved that the apparent use of chemical weapons at that time was not done by the Syrian government, but by rebel groups. He responded to the four-page memorandum by the White House, claiming that they had absolutely undebatable proof that it was the Syrian government. He published a 14-page paper in which he used Google Earth material and photographs that are generally made available, to say that by analyzing the pipe out of which the so-called chemical gas came, it could not have been dropped by an airplane, but it had been delivered by other ways. Here he shows some more technical details. This is now a situation where yesterday Russian Foreign Minister [Sergey] Lavrov and President [Vladimir] Putin met with Secretary of State Tillerson; they had five hours of discussion, and with President Putin two more hours of discussion. The White House maintained the story that they have the proof that this was the Syrian government; the Russian government said no, we need an international investigation immediately, because you cannot condemn somebody where the evidence is so absolutely ludicrous. 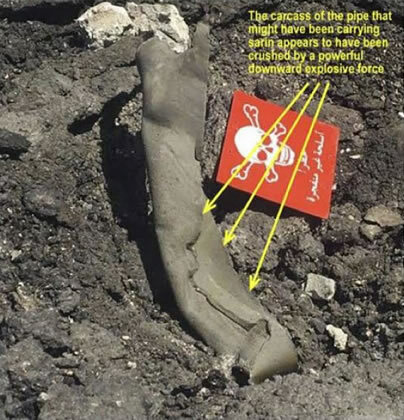 Deformation of sarin containing pipe and crater from the action of the explosive charge placed on top of the pipe. 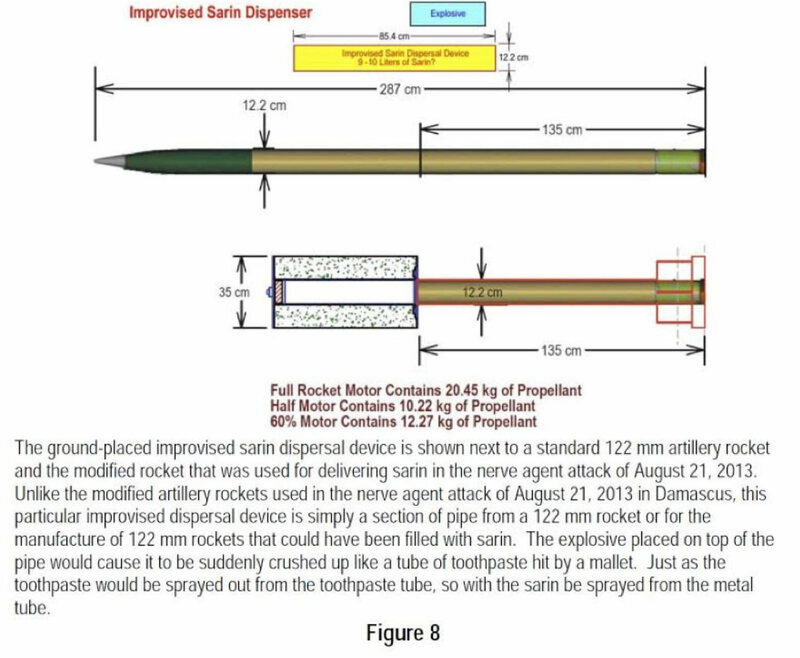 The ground-placed improvised sarin dispersal device is shown next to a standard 122 mm artillery rocket. The explosive placed on top of the pipe would cause it to be suddenly crushed, like a tube of toothpaste hit by a mallet. 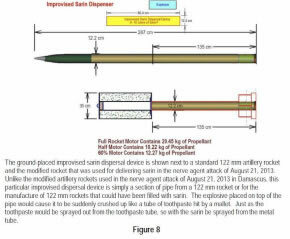 The sarin would be sprayed out from the metal tube. The site where the [chemical] attack occurred was held by an organization called Liwa al-Aqsa; and the Syrian government and also the Russian government maintain that the object which was hit was a storage place for chemical weapons that are produced by the rebels. The logic of the whole thing is also clear. Remember that in 2013, there was a tremendous intervention with Russian help; the Syrian government agreed to dismantle its entire chemical weapons stockpile. It was destroyed. Eight of ten production places were destroyed, and two remained in the area where the rebels are. The Syrian ambassador to the United Nations put out a statement yesterday saying that he sent 80 letters to the UN Security Council, giving them data on where the rebels were using this; where it came from—even Turkish intelligence helped. So why would President Assad, who is currently, with the help of Russia, winning the battle on all fronts, why would he risk this very favorable situation by using chemical weapons against a target which is of no military use whatsoever? Why would Russia, which has put a lot of political investment in getting the Syrian government to dismantle its chemical weapons, why would they idly sit by and allow this to happen? It just does not make any sense at all. There is no evidence. If there were any evidence, the U.S. would have presented it already; but the latest statement from the United States is that they have to protect their “methods and sources.” To take pictures like that from the air, from satellites, is not such a secret thing. This is now a serious problem, because there are many experts, including top Mideast experts in Europe, who say that this military strike [on the Syrian airbase] was completely illegal; it had no UN mandate, it had no Congressional legitimization, it had not the article of legitimate self-defense according to Article 51 of the UN Charter. If there are further attacks—and President Putin has warned already that the U.S. attack encourages other rebel groups to do other such operations in order to lure the United States more into this conflict—this could then bring a showdown with Russia in the short term. It also has relevance for NATO. There was a judge of a federal court in Germany who made the point that if it were to come to a military confrontation between the United States and Russia over this issue, NATO members could not be asked to come to the defense of the United States according to Article 5 of the NATO Charter; because if a force reacts to an aggression, this article does not apply. So, it’s a very hot situation. But one of the most incredible things is that the same international corps of neo-cons and neo-liberals who immediately after the election victory of Trump, used the most inciting words for Trump—calling him a fascist, a hate preacher, an unstable sociopath, an incompetent monster—they are suddenly saying he is a great commander-in-chief; he did everything right. [German Chancellor Angela] Mrs. Merkel and [French] President [François] Hollande said they are full of understanding for what Trump did; which is incredible! How can heads of government who supposedly hold up democracy and human rights, who are the defenders of Western values; how can they condone something which is so blatantly illegal? British Foreign Secretary Boris Johnson insisted that an ultimatum should be put to Russia to give up support for President Assad; which naturally and predictably, President Putin refused. There are many people who are warning that if Trump gets lured further into a direct conflict with Russia, that will lead to nuclear war. We are still, despite the effect of Tillerson’s mission, on red alert. What is going on? After Congressman Nunes had been shown evidence, in the Old Executive Office Building, that there was invasive electronic surveillance of Trump and the Trump team, two former high-ranking intelligence officials wrote an article with the headline “The Surveillance State behind Russia-Gate.” They were Ray McGovern and Bill Binney. They said the fact that this evidence about this surveillance has now been documented, presents Trump with “the unwelcome but unavoidable choice to either confront those who have kept him in the dark about such rogue activities or live fearfully in their shadow,” and capitulate to them. Now, this is hopefully not yet a finished question, but Trump’s choice of what he will do in the future, will decide whether there is a future for this constitutional republic, if the human species exists or not. Now earlier in the year, in the The Bulletin of the Atomic Scientists, they wrote that already with 90% of the world nuclear weapons at the ready in the United States and Russia, that in 2017, tensions could lead to a thermonuclear conflagration, that it is two and a half minutes to midnight, the clock is ticking. And after the U.S. military attack, Russian Prime Minister [Dmitry] Medvedev said the relationship between the United States and Russia is now completely ruined, the U.S. is on the verge of a military clash with Russia. This was a little bit toned down, but President Trump said yesterday that the meeting with Tillerson in Moscow went better than expected, but the relationship with Russia is still very bad. What happened to that Donald Trump who won the election on the basis of promising to improve relations with Russia, to collaborate with Russia, to defeat ISIS, and to end the policy of regime change and interventionist wars? All these policies mentioned by Trump represent a direct threat to the British Empire. People are completely mistaken to think that the British Empire no longer exists. What happened is that after the collapse of the Soviet Union, the efforts went under way by Great Britain and the neo-cons in the United States to establish a unipolar world. One can also say it’s the same thing as globalization: it’s an attempt to establish a world empire based on the Anglo-American relationship; Francis Fukuyama prematurely declared the end of history, meaning the whole world would be turned into democratic states, and they came up with such things as the “right to protect,” “humanitarian intervention,” “regime change”—color revolution against any government that would not submit. And just for the record, the Ukraine crisis was entirely the fault of the West. It was not the fault of Russia, because when the European Union (EU) tried to bring Ukraine into the EU Association Agreement, and President Yanukovych refused that, that is what triggered the Maidan which was financed by NGOs [non-governmental organizations], by [Assistant Secretary of State] Victoria Nuland, and by people who are clearly fascists, in the tradition of Stepan Bandera. They made a coup, and Russia reacted to each step, including the situation in Ukraine, and including the vote in Crimea, which was not an annexation, but a vote of the people of Crimea that they wanted to be, again, with Russia. The narrative about Ukraine has to be straightened out, and I would urge all of you: help us to disseminate the documentation we have made about this case. Because this is the cause for the demonization of Putin and Russia in general. Now, this idea of regime change is what led to the Orange Revolution of 2004 earlier in Ukraine, to the Rose Revolution [in Georgia], and to the attempted White Revolution against Russia. They attempted a Yellow Revolution against China with the yellow umbrellas in Hong Kong, which fortunately, didn’t go anywhere. But this was the basis for the regime change policy in Iraq, Libya, and Syria. It left much of Southwest Asia in ruins. It is the cause for the refugee crisis. It had a military side, turning the Middle East into a Hell; it had an economic side, which made the rich richer by deregulation of the banks, and made the poorer. It was the rejection of this policy paradigm which was the reason for the Brexit, which was the reason for the election of Trump, and the reason for the “No” of the Italians to the referendum by then Prime Minister Matteo Renzi—and it will continue if the injustice which is associated with that paradigm is not cured. And because we have a couple of very important elections in Europe still to come, you may have some more surprises along these lines. It was that empire, not a nation, not Great Britain, but the idea that you can run the world as an empire by an oligarchy, which regarded the Trump election and the Trump campaign promise as an existential threat. This is why immediately after Trump was elected, the British paper Spectator openly said that he will not stay in office for long, he will be removed, either by assassination, impeachment, or a coup d’état. And the role of British intelligence in creating the “dodgy dossier” by Christopher Steele, a former MI6 agent, is also very clear. And the entire story that Trump won the election because of Russian interference comes not only from the Hillary Clinton campaign, but this was concocted with the help of British intelligence. President Putin correctly said what happened against Trump is a color revolution, is a Maidan, and that anti-Russian hysteria, targeting one of the more efficient members of the Trump administration, General [Michael] Flynn, and then [Attorney General Jeff] Sessions—this all created a McCarthyite hysteria, where just talking to a Russian diplomat is already something which makes you a stooge, an agent. It is the business of diplomats to reach out to the people of the country where they are and have contact! So the mainstream media are completely uniform in lockstep and they are continuously putting out fake news to control the narrative. 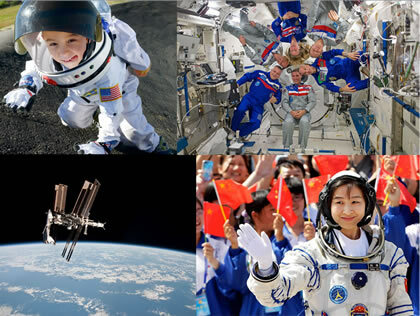 On the other side, when President Trump did something really beautiful and good, like making a speech in his Weekly Address about renewing the space program, using beautiful pictures from the Hubble Telescope, or saying he wants to revive the American System of economy, quoting Alexander Hamilton, Henry Clay, and [President Abraham] Lincoln, there was not one word in the mainstream media. The big question is, can this coup be reversed? Well, it requires a comprehensive national and international effort. First of all, we have to mobilize Trump’s base, who must understand that what is happening is a British operation. If they are just disappointed and turn away, this is not good enough, because then the efforts to control Trump will escalate and the danger is small attacks against Syria, a clash with Russia—who knows what will happen in the North Korea crisis, which is extremely hot and may get hot toward the weekend. Remember that the American War of Independence, that which created the United States, was made against the British Empire, and the British Empire never gave up the idea of reconquering the United States. The first time they attempted that was in the War of 1812; then the British Empire allied with the Confederacy. If you go to the battlefield of Gettysburg, you can actually see the traces of this, and if you study this matter, the British banks financed the Confederacy in this war through their affiliates in Boston and Philadelphia and so forth. The British Empire got totally upset when Trump announced that he wants to go back to the American System of economy, of Alexander Hamilton, Henry Clay, and Lincoln. You should just re-read what Henry C. Carey wrote about the difference between the British Empire economy, which makes people poor, and the American System of economy, which is concerned about the well-being of the labor force, and raising living standards and so forth. We need people to become conscious of American history again. We need an immediate UN investigation into these chemical substances. We should distribute the work of the former intelligence people who are already on the move, issuing open letters to President Trump trying to correct this story. The fight for Glass-Steagall must be accelerated; the bills in the House and the Senate must win overwhelming support. Then, we should push and mobilize for President Trump, who accepted an invitation to China for early this year at his meeting with President Xi Jinping, should accelerate that visit, so that Trump should actually participate in the next month’s meeting: On the 14 and 15th of May, there will be an historic summit, the Belt and Road Forum. 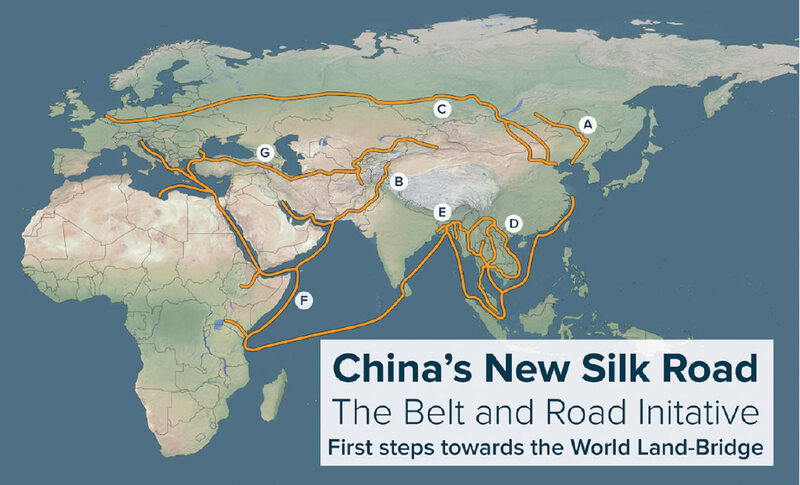 This will be the confirmation of the New Silk Road initiative, in which already about 20 presidents of countries, 150 leaders of international organizations, and 1,200 scientists, economists, and businessmen, have agreed to participate and discuss further how to develop the idea of the Belt and Road Initiative. This means four weeks to escalate the mobilization in the United States, for the United States to join the Silk Road. Now, this initiative, which was announced three and half years ago by President Xi Jinping, has in the meantime developed a gigantic dynamic. It’s the biggest infrastructure program in history. It’s already 12 times bigger than the Marshall Plan; it already involves 70 nations and 30 international organizations. 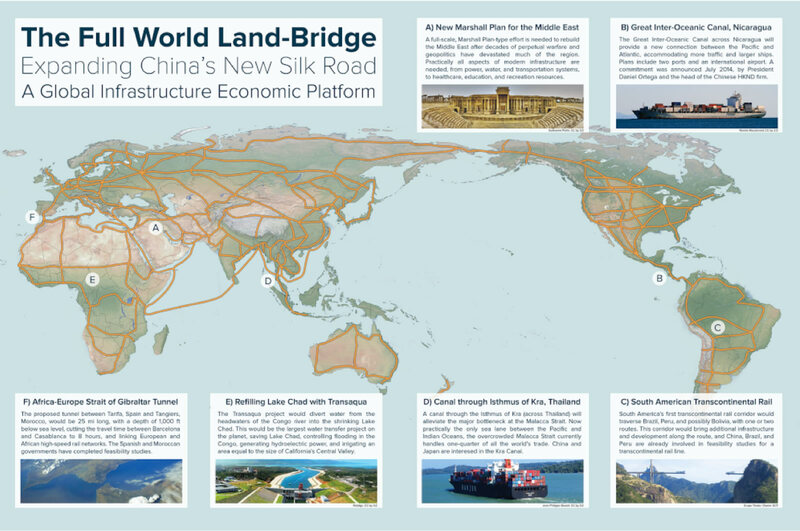 And it includes six economic development corridors and the 21st Century Maritime Silk Road. The first such corridor is the one from China to Central Asia and West Asia, going potentially into Afghanistan. When President Xi was in Iran last year, President [Hassan] Rouhani already agreed Iran will cooperate. It can be extended to Iraq, Syria, Turkey, Egypt, and Europe. One of the next corridors is China-Myanmar-Bangladesh-India, which is right now a little bit in trouble, because India is not yet totally convinced, because they are still are a little bit in the old geopolitical view; but it would mean the first express highway between China and India. You have the China-Western Europe route, which is developing incredibly quickly. It goes from Chengdu, Chongqing, Yiwu, and Lianyungang, to Duisburg, Hamburg, Rotterdam, Lyon, and Madrid, and it reduces the travel time of cargo and people from five weeks by ocean to two weeks by land. And it already has eight routes, and there is now a daily train leaving Chongqing to Western Europe. Then you have the Mongolia-China-Russia corridor, which involves 32 projects. You have the China-Pakistan corridor which is huge: It is already creating 700,000 jobs in Pakistan, and it produces 10,400 kW electric power; China has invested $46 billion into that corridor. This great project is developing great attraction, because it offers “win-win cooperation” to do what China did in the last 30 years, when they brought about the biggest economic miracle in history, by lifting 800 million people out of poverty—and the countries which are now cooperating simply will have the same advantages. For example: The 16 plus 1 group—these are the Central and Eastern European countries which officially are mostly in the European Union, but because the European Union has an insane austerity policy and is not investing in infrastructure, many of the East European countries are now with the New Silk Road, including Greece, Serbia, and Hungary. The EU opposes a fast train connection between Budapest and Belgrade, which is completely crazy because China is financing it, and Serbia is so happy that for the first time they are getting real investment in infrastructure. [Serbian] President [Tomislav] Nikolic, who was just on a state visit to China, said that Chinese help in building their infrastructure shows the greatness of China, because they have done something which no other country did for Serbia. But also the Swiss are absolutely happy about the cooperation with the New Silk Road. The Swiss President will go to the Beijing forum; also Italy, which has a huge problem with the refugees, as well as Spain and Portugal. 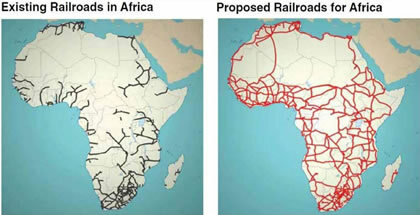 But the truly fantastic development is the change the New Silk Road is causing in Africa. There is a completely new spirit, where African leaders who for many years were completely desperate about poverty, famine, and wars, are now saying there is a real chance to overcome poverty and underdevelopment with the help of China. Just a couple of weeks ago, the first railway between Djibouti and Addis Ababa was opened. This is extremely important, if you want to transport, for example, food to these famine-stricken areas. Also, a new railway is being built between Rwanda and Congo. China is the leading job creator in Africa—they have created 30,000 jobs in the past two years, and 40,000 Africans will be trained in China. China-Africa cooperation has been upgraded from a trade relationship, into an industrial relationship focusing on manufacturing, energy, and maritime economic development. And many Africans have told me and others that they see in the Belt and Road Initiative the possibility to realize the African Dream of poverty reduction and elimination. China has pledged $75 billion of funding to Africa, especially for small and medium-size enterprises (SMEs). The Rwanda situation is a showcase for the Chinese model of assisting African growth. Rwanda, as you know, was struck by terrible genocide in 1994, but with the help of China it is now on a completely new path, becoming one of the fastest-growing economic areas in Africa. It’s landlocked, it has almost no raw materials, but the Chinese are training the local population. They are already building the Rwanda segment of a 2,000-km northern corridor between Kigali, Rwanda, and Mombasa, Kenya, via Uganda. The Chinese Export-Import Bank is giving a $1.2 billion loan to fund the Rwanda section which starts this year. 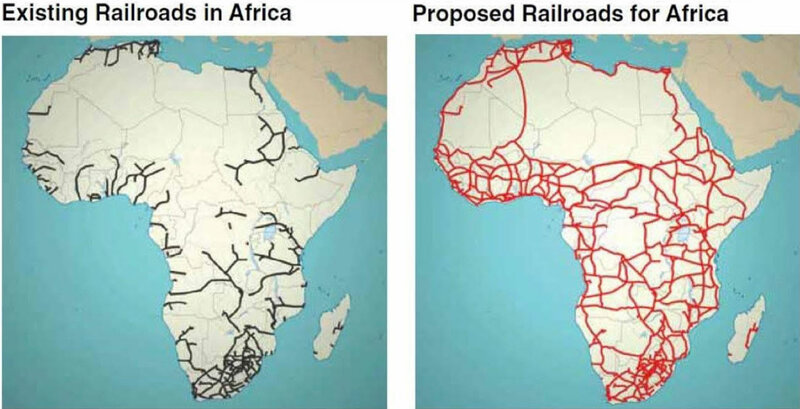 This means that for the first time, there will be a railroad from the coast to the heart of Africa, something the colonialists never did. Look at the slide of the Transaqua project again. This is one of the most promising projects for the future of Africa, the Transaqua Project for which we in the Schiller Institute have fought for 30 years: It’s the idea of taking the water from the tributary rivers of the Congo, at a height of 500 meters, and bringing it back through a system of rivers and canals to Lake Chad, to refill it, and it would help 12 countries to get irrigation and hydropower, and have modern navigation for shipment by water. Now, given the starvation crisis going on in South Sudan; Somalia, where 8 million people are in danger; and in Yemen, where half the population is about to die because of the Saudi blockade, China has said that because of the refugee crisis in West Asia and North Africa, it is now the time for China to expand its humanitarian assistance and more deeply engage in global refugee governance. That since the Western countries decided to decrease contributions to the refugee crisis, and in the United States, even impose a travel ban on some people from these countries, China, given its increasing strength, will play a bigger role to help to solve this problem. The Western countries have decreased their contributions to accommodating the refugees, and the United States has even imposed a travel ban. China, given its increasing strength, will play a bigger role in helping to solve this problem. 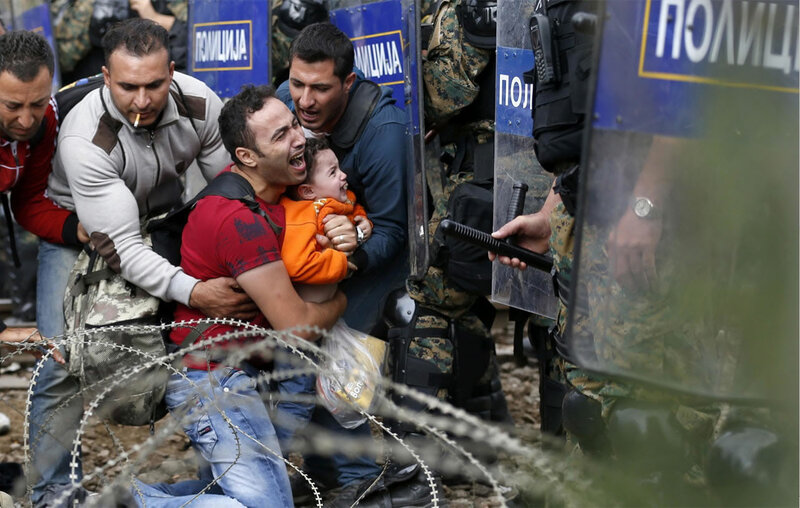 Now, if you compare that with the despicable policy of the European Union, which knows nothing better than to build fences, get the EU border patrol Frontex to push people back, and to have intern camps in Turkey. They tried to do it in Egypt and Tunisia, but, fortunately, the Presidents did not go along with that. You can see that the way to go is, that if the United States, and hopefully some European countries, would join hands with Russia and with China, we can rebuild the Middle East from its war-torn condition, we can overcome poverty in Africa, and solve the refugee crisis in a human way. In terms of investment volume, China is first in railways, but people don’t know that Africa right now has the highest growth rate in new railway construction, due to Chinese investment. 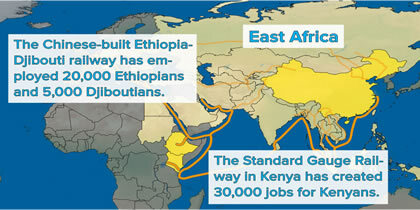 The Japanese monthly Sentaku attributed the miraculous growth in Africa to the Belt and Road Initiative, connecting the ancient trade routes in China to Europe and to Africa. The five biggest railway projects are currently being built in Africa with Chinese participation, and Chinese investment is huge! They invested $75 billion in 1,700 projects between 2000 and 2011; it has gone up since then, and in 2016 alone, they invested another $75 billion. Now, why am I saying that the well-being, Happiness, and likely existence of mankind depends on the United States accepting the offer by Xi Jinping to join the Belt and Road Initiative? Because if the United States would leave geopolitics and cooperate in a “win-win” mode, it reverses and eliminates the danger of a geopolitical confrontation. And there are many, many areas of possible cooperation, bilateral but also involving third parties. Now, Trump has promised to invest $1 trillion in the reconstruction of U.S. infrastructure. The American Society of Civil Engineers has said the requirements are actually $4.5 trillion, and at a recent conference in Hong Kong, some Chinese scholars made the point that the actual need is $8 trillion. Now, having driven by car yesterday from Washington to New York, I would say the need is $20 trillion at least! So, the Belt and Road cooperation could use the Chinese experience to build up U.S. infrastructure. And China has done miracles—if you go to China and you go on the fast trains, they go 350 kph, they are smooth, no noise, they don’t rattle, and China has already built 20,000 km of such high-speed railways, and they want to have, by the year 2025, some 50,000 km of high-speed trains connecting all the major cities of China. But this would also be a big boost to U.S. manufacturing: It would create jobs and revitalize the U.S. economy. Because of the outsourcing under the previous free trade agreements, the United States has no more middle-level industry. They don’t have a complete upstream and downstream industrial chain. China, on the other hand, has a complete industrial chain, and a relatively low cost of production. China is also the second-largest holder of U.S. Treasury bonds, and these bonds have been offered by China already to be used for infrastructure financing in the United States. My husband, Lyndon LaRouche, has long made a proposal to create a National Bank in the tradition of Alexander Hamilton—whom Trump recently has talked about based on the American System. This National Bank could become a vehicle to move those Chinese holdings into productive investments in the United States. So, what the United States needs, both in terms of experience in infrastructure-building, but also in terms of financing, China could provide. And I think that this kind of financing will be important, because many people who want to make 25% per year, will hesitate to invest in infrastructure, because infrastructure does not yield a direct profit, but it creates the environment for the economy to grow. Also, a point which I think needs to be discussed much more, is that the American model of economy is actually much closer to what China is doing than people know, and since we have a day to discuss these matters tomorrow, this will also become clearer. Now, building up U.S. industry would mean the United States can export more to China. China has a growing middle class, and because of the structural reforms initiated by President Xi Jinping, they want to build up their domestic market, which means potentially a huge market for U.S. exports. 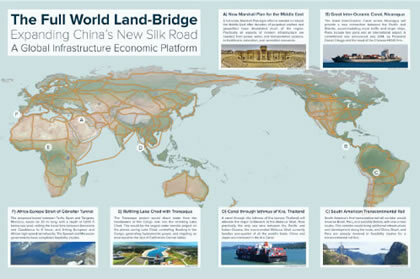 But the United States and China could also join hands and have joint ventures in third markets. The United States has more experience in investment in some countries, and then China and the United States could be complementary in their efforts. In 2016, the bilateral trade volume was $519.6 billion. The bilateral investment grew to $170 billion in the same year, but in the past 10 years, U.S. exports to China grew 11%, but Chinese exports to the United States only grew 5.6%. “The Ideal City” (ca. 1470) by the Renaissance genius, Piero della Francesca. Now, with the Belt and Road, this potential would rise tremendously. 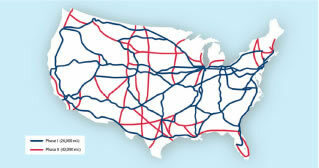 If the United States, which has right now almost no train system worth speaking of, were to have such a system of infrastructure development, you could solve all problems; you could revitalize the Rust Belt; you could reindustrialize Detroit; you could have water management systems along the West Coast; and you can build beautiful new cities. This is the model of a Renaissance city, and when we build new cities, they must not look like Houston. They can be based on the Golden Mean in architecture; they can be beautiful, and they can become research centers, science cities where international scientists work together, and where students are being educated. 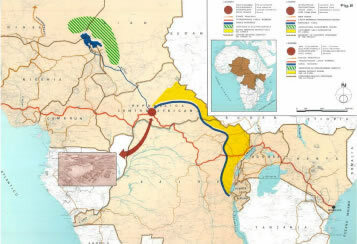 When we designed the World Land-Bridge, which is actually the product of 26 years of work by the Schiller Institute—it’s really a plan for the reconstruction of the world economy; it’s the idea that you will have fast train systems connecting the southern tip of Latin America, Argentina and Chile; you go up by a fast train system through Central America, through North America, and connect through the Bering Strait to the Eurasian transport system; and we can really move to bigger things in the future. If you reflect on how much mankind has progressed in the past 10-20,000 years, which on the scale of universal history is a very, very short moment: You had the first human infrastructure development when people settled by the rivers and the oceans; then they started to build roads going inland; then you had shipping, then people started to build canals—the first one in Europe promoting this idea was Charlemagne. And a gigantic jump in human development was made with the railway system. 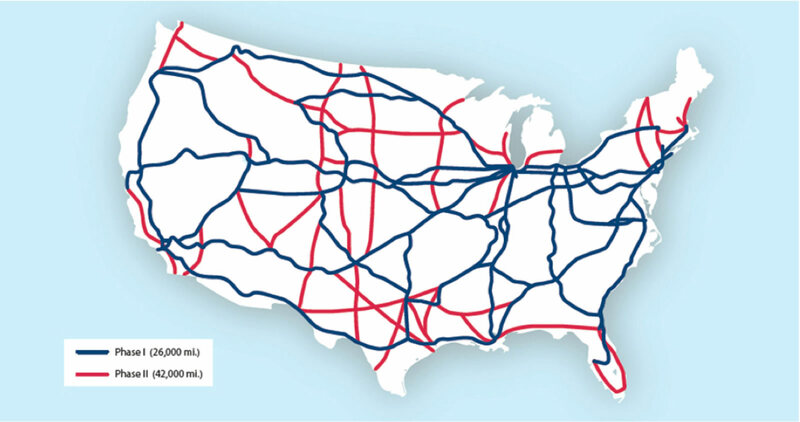 You had transcontinental corridors, and that process will grow into the World Land-Bridge, where you will have a connection between all continents through tunnels and bridges. You will have future generations of maglev systems going through evacuated tubes where you can travel at Mach 1 very quickly to anywhere in the world. This will completely change the character of civilization. And the next phase of human development, which already has started, is the industrialization of space, beginning with the Moon, and with fusion technology, we will soon have interplanetary travel. This will change and improve the character of our species again and again, because human beings are limitlessly perfectible. Just think about the incredible upward development of the past 10,000 years, and then think what we will do in 10,000 years from now? And that exponential development we can only have as a hypothesis. Should we ruin this optimistic vision of the future by having a nuclear war, which will end civilization? On the sidelines of the annual National People’s Congress in Beijing, Chinese Foreign Minister Wang Yi stressed the importance of China, the United States, and Russia working together, by emphasizing that it is the relation among these three that makes the difference. It must not be a see-saw game, not a zero-sum outcome, but their healthy collaboration means their joint responsibility for world peace. 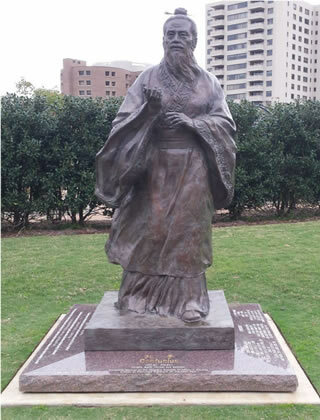 The Great Confucius Statue at Hermann Park in downtown Houston. The President of the United Nations General Assembly, Peter Thomson, recently said that the Chinese initiative of the New Silk Road/Belt and Road Initiative is the only future for mankind. And I fully agree. Because it elevates the collaboration among nations to a higher level of reason, to what Nicholas of Cusa would call “the coincidence of opposites,” where the One has a higher existence than the Many. And it must be accompanied by a dialogue of the best traditions of the cultures of all nations of this world—and that will be the subject for tomorrow. But I want to remind people that one of the founding fathers, if not the founding father of America, Benjamin Franklin, discovered at a certain point the writings of Confucius, and he was so excited about Confucian teaching that he wrote that only through self-improvement can you progress and have peace, in the family, in the state, and finally, among the nations. He used the moral teachings of Confucius to shape the becoming of the United States. And the most important thing about Confucian teaching, is the idea that you must have one thing above everything else, and that is, love for mankind. Now, Confucius said, you can love at will—if you decide to love, you can do it instantly. I think this is what we should keep in mind and have that love for mankind right now, because I think mankind is the most beautiful thing in the world, and it’s in mortal danger. But the horizon, what mankind can become if we go to a new epoch, the New Paradigm of working together, and of developing each other’s creativity, is limitless. So let’s mobilize such a love.